Taking preemptive steps can help you to prevent post-press paper problems. There are a lot of factors that go into printing a product. When something goes wrong, you have to take into consideration the paper, ink, toner, varnish, coating, and environment. It can sometimes feel overwhelming when you try to solve post-press paper problems and are faced with the many possibilities of what could be contributing to the problem. Although every problem is unique, there are a few that happen to crop up more often. Luckily, if you know what a problem is likely to be, you can jump ahead to the known solution. 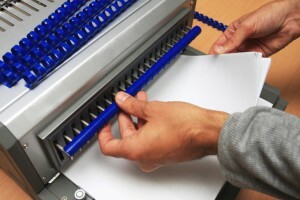 Here are some things you can do to prevent some of the most common post-press paper problems. It may seem like a no-brainer, but if you aren’t following the manufacturer’s guidelines and you keep running into post-press paper problems, then it’s probably time to whip out the instruction manual. These guidelines were written by scientists who intensely studied the best way to operate your machinery. So, for example, if the guidelines state that temperature and humidity need to stay constant for the machine to work consistently, then make sure you aren’t turning off the heat or air conditioning over the weekend. The money saved in electric costs will only end up being lost to faulty printing jobs. And that means all your vendors. While Atlantic Graphic Systems is happy to offer maintenance services for your printing equipment, you should also keep up with the latest changes from all of your material suppliers. If your supplier publishes a newsletter, be sure to read it. Or speak frequently to your salesperson for updates on changes to the materials. By keeping on top of changes, you’ll be able to adjust your machines accordingly if the paper manufacturing process changes. Just as you want to keep track of any changes from your manufacturer, you also want to keep track of any changes in your own processes. Tracking and measuring the way a certain job is done will help you to identify the cause of a problem if you end up running the same job again down the road. This entry was posted on Friday, April 29th, 2016	at 2:35 pm	and is filed under industry practices	. You can follow any responses to this entry through the RSS 2.0	feed. Both comments and pings are currently closed.